This week has been crammed full of after work meetings that kept me from doing very much fun stuff. This post is going to be short, so let's get to it. 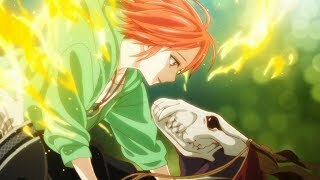 In the world of seasonal anime, I'm continuing to watch Ancient Magus' Bride. It remains the best true fantasy series that I've seen for awhile. Much of the genre has, lately, been dominated by alternate world and RPG influenced shows, like Konosuba and Grimgar of Fantasy and Ash. A series where the viewer is learning about the magic aspects of the world at the same pace as the main character has been lacking for several years. At least one with the polish and cohesive world-building of Ancient Magus' Bride. I have not read any of the manga at this point; and I don't think I'm likely to do so. I enjoy discovering the story on a weekly basis, rather than waiting several months between manga volumes. I also watched the premier of Pop Team Epic, and I'm not really sure how I feel about the show. I think its funny, but feels like it could end up going into a reference hole, where it has not humor of its own, but depends entirely on people recognizing things from it. I'll give it the customary 3 episode trial before I pass judgement on it. After watching the latest Nintendo Direct, Crystal decided to download the Dragon Warrior Builders demo. I gave it a try as well, and thought it was reasonably fun. I've never been huge on Minecraft, so i didn't have a lot of expectations about the game. It took me a little while to get comfortable with the camera controls and I also had some trouble in some cases getting my buildings to end up where I want them. The game could be improved by adding a way to lock the character in place so that you can spin and more easily select specific squares. The humor is fun, and the characters interact well with each other. Crystal is planning to buy the full game when it is released for the Nintendo Switch, and I'll give it a further try then. That's all I have for this week. Being one of the lucky few to have today off, means that I'll get to spend more time enjoying myself this weekend. Which is also convenient since my wedding anniversary is also this weekend; I've been married to Crystal for 11 years now, and I'm still enjoying every day more than the last. As for you, have a great week and game on.